Do you hate having a ton of toys laying around your house? So do I! We are really good about limiting the gifts but we still have pieces everywhere. 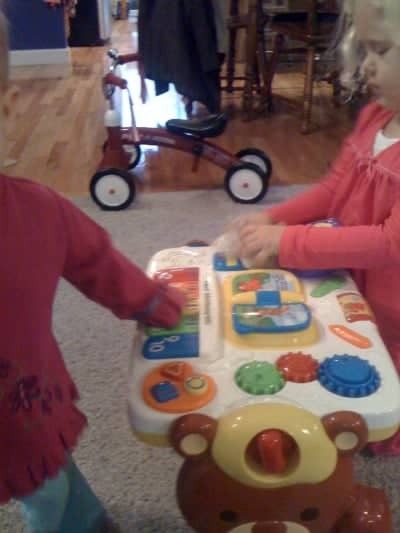 In order to keep my sanity, I have been looking for toys that are self contained and so I was really excited when V-Tech sent me a 2-in-1 Discovery Learning Table. Not as excited as the girls were, though! The 2-in-1 Discovery Learning Table is geared for children ages 12-36 months and I would agree. 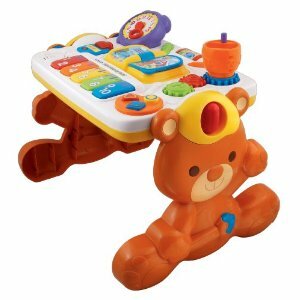 One side is an interactive learning table with buttons that teach nursery rhymes, numbers, shapes, colors. It also has some cool gears, a clock and a roller that plays the Alphabet song. The other side is a table that can be used to color on. 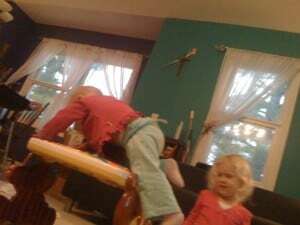 The table top can pivot to three different points depending on how your child might use it. It was super easy to put together. In fact, I think it took longer to take it out of the box than to put it together. Even so, it was out & functional in less than 5 minutes. With a “helper.” Ahem. My one year old LOVED it. She was so excited to play and push the buttons. Even after having it for a week, she will look for wherever it was moved to and play with it. Her (almost) four year old sister is enjoying it as well. The V-Tech 2-in-1 Discovery Learning Table is also super durable. The one year old frequently climbs on it and it doesn’t appear to have any effect on it. The only problem that I did have was that the locking mechanism that needs to release to flip the table over is SUPER tight. We still haven’t been able to flip it over yet. I also liked that it is easy to break down (in theory) and stores compactly when not in use. Our family has really enjoyed it and we would definitely keep it for future kiddos. This would be a great gift to purchase and have shipped to someone far away because it ships & stores compactly and is super easy to put together!